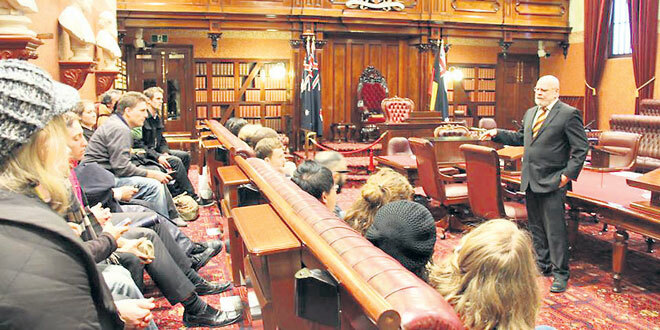 Young Political Activist Training (YPAT) is a unique opportunity for young people (aged 18 to 30 years of age) to understand the root causes of the current problems in Western society, and how they can make a practical difference to better the future of Australia. YPAT builds its philosophy on the firm foundations of Christian Social Teaching, injecting fresh insight into the politics of today. YPAT is open to young people of all or no faiths, as long as you are of goodwill. Over one week, participants attend talks from leading ethicists, journalists, politicians, historians, activists and academics, as well as practical workshops and excursions. All accommodation and meals are provided. We look forward to meeting you at YPAT soon! Young people at the 2014 Young Political Activist Training conference in Sydney. LAUNCHING a career in politics isn’t the only way to turn influential ideas into policies and laws. National Civic Council Queensland president and father to five Luke McCormack believes any professional young person has the capacity to influence Australia’s democratic process without becoming a candidate. “Society was built on institutions, and of course the political realm is one, unions are another,” Mr McCormack said. The political playing field also includes grassroots activists, influential professionals with high volume in the public square, and an in-depth understanding of practical politics. It’s because of a desire to bolster these groups that Mr McCormack has been on the planning team for a seven-day “crash course” in political engagement. The intensive conference, will not only offer a Christian perspective on practical politics, including an understanding of factions, ideologies and campaigning, but could also improve young people’s trust in politics. According to new research released in May from the Institute of Governance and Policy Analysis, trust in Australian politicians is at an all-time low across age groups. “I think because politics is often disappointing and has been recently unstable, people can become cynical or lose trust,” Mr McCormack said. “By taking up interest in this intensive on politics and how practically it works, (young people) will realise that democracy is alive and well. While the conference will present politics through a Christian lens, Mr McCormack said YPAT would present a challenge to “blind party followers”. “We’re not aligned to any party, and the speakers and presenters will be from various parties,” he said. Quoting from the Australian Catholic Bishops Conference, who released a statement ahead of the federal election, Mr McCormack stressed the importance of engaging in politics for the voiceless. “The bishops’ recent statement, Vote for the Voiceless, reminds us of who we’re meant to serve as leaders – to serve those who are part of the needy, the voiceless and unseen, who have no lobby groups, no money to purchase media time – which includes the unemployed, but also covers the forgotten people, from the unborn to jobless fathers, to the sick and elderly,” he said. The YPAT live-in conference is limited to a maximum of 30 participants and will be held during the federal election at the University of Queensland’s Women’s College.